Nowadays, Magento Go store owners are in search of the alternative to their current platform. Why is it so? All because this shopping cart is going to be closed on February 1, 2015. Luckily, there are dozen of platforms that can provide much better functionality. One of them is Shopify, which is hosted solution as well and offers an enormous set of features. It is really easy to use and provides advanced tools for CSS and HTML editing. All of these features encourage merchants to perform Magento Go to Shopify migration. Now, lets take a closer look at the opportunities of online shop building with one of the most easy to use shopping cart. In comparison to Magento Go, Shopify provides merchants with wider design options and more efficient SEO features. Moreover, the second solution wins in a field of customers Support. Merchants with any pricing plans can call, email or chat with technical stuff while Magento Go provides limited access for cheaper options. So, if you are looking forward to migrate to Shopify, you will probably hit your target. For your better convenience we’ve designed an infographic, that highlights the benefits of automated shopping cart migration. Take a look through it below and get ready for effortless switch. 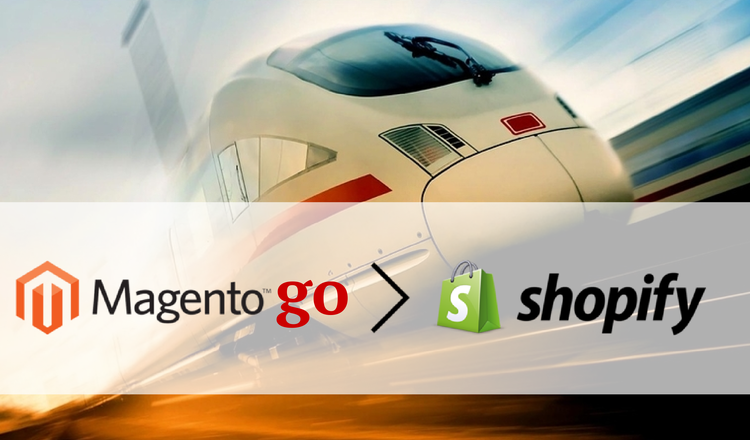 Now you know what is the easiest way to move from Magento Go to Shopify. So, register a new account right now and make another step forward to rescue your online business.